With the recent announcement from Boeing that the first flight of their 787 was to be delayed due to structural issues in the wing box area, many of us knew right away it was a major show-stopper issue. Boeing made the announcement only a few days before people were expecting the first flight, catching many by surprise. With so much riding on this project and so many delays already experienced, Boeing were pushing hard to get the 787 in the air as soon as possible. That Boeing couldn’t start the test flights while addressing this problem in parallel showed us it was a big issue, something that would either lead to a structural failure in flight or would require so many changes that testing would have to start again after the modifications were made. Subsequent to their announcement of a delay, it was confirmed that the issue involves wing flexing travelling into the fuselage leading to delamination of wing panels. This report and others do not paint a very pretty picture with many predicting that the 787 won’t fly until next year (2010). All of this puts a major strain on the credibility of the programme, Boeing’s bottom line and their share price. They are eager to reach the first flight milestone and progress quickly towards delivery payments from customers. Anything that is feasible and safe will be done to get the 787 airborne ASAP, thus the longer the delays we’re seeing, the bigger the problem becomes. The 787 is breaking new ground in many areas, from structures to systems to construction & assembly processes. In many ways this is similar to the de Havilland Comet that ushered in jet travel to an eagerly awaiting world. While bringing in new technologies such as advanced alloys and new bonding methods, the Comet was also extensively tested prior to its entry into service. 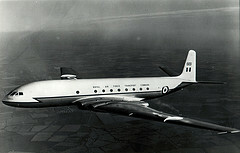 The Comet also utilised existing concepts such as large, square windows & hatches in the fuselage. As was tragically discovered, stress concentration occurred around the corners of the windows & hatches, leading to higher pressures in those areas and, eventually, metal fatigue that ruptured the fuselage with catastrophic results. By the time the problems were resolved, the Boeing 707 had eclipsed the Comet and, together with the Douglas DC-8, taken over the jet transport market. Boeing and Douglas both certainly benefited from the painful lessons learned from the Comet. Returning to the present, Boeing discovered the 787’s structural problem during fatigue testing of a designated airframe. Despite countless computer simulations the issue was apparently never predicted and, like the Comet, took them by surprise. Fortunately in this case the problem was discovered on the ground and without loss of life. Also fortunate for Boeing is that the Airbus A350 is still lagging the 787’s schedule, although the distance between them is rapidly decreasing. If the 787 doesn’t fly until 2010 and Airbus can hit the A350’s scheduled first flight in 2011, things could get very bad for Boeing. While I doubt many 787 customers will be seriously considering converting their orders over to the A350 at this point, if the A350 continues on track and meets its target figures, further delays of the 787 will make the Airbus product start to look more interesting to 787 customers. If that happens, Boeing will be in big trouble indeed! This entry was posted in Commentary and tagged 707, 787, A350, Airbus, Boeing, Comet, DC-8, de Havilland, Douglas, PCDU_blog. Bookmark the permalink. 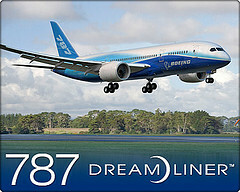 One Response to Is the Boeing 787 the new Comet?